Garden herbs grow well in pots, and typically can thrive indoors when situated by a window that lets in ample amounts of sunlight. 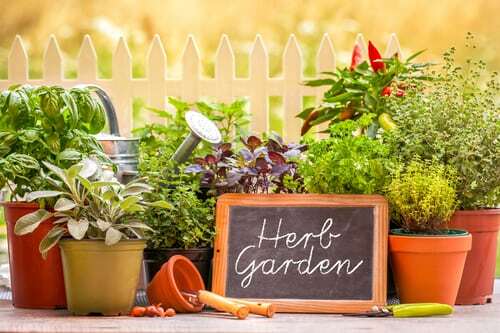 Serving to both zest up your dishes and supplement your living area with a pleasant aroma, it makes a lot of sense to place potted garden herbs by kitchen windows. Basil, rosemary, and mint are ideal candidates, as they are highly aromatic, broadly applicable for culinary uses, and relatively easy to grow. Tomatoes famously grow well in pots, and look great on a deck area. A sun-loving crop, be sure to situate tomatoes in areas that receive plenty of natural light. Originally from the South American Andes, tomatoes quickly made their way into countless culinary customs worldwide following the colonization of the Americas. Bountiful, colorful, and delicious, this sweet and savory fruit can be used for a myriad of sauces and dishes, including: pico de gallo, marinara sauce, ketchup, ratatouille, tomato and cheese pie, and a summer classic, tomato sandwiches. Aloe Vera is a handy potted plant in the summertime because of its medicinal use of allaying discomfort from sunburn. Traditionally used for treating a wide basket of ailments including constipation, dandruff, and minor burns, recent research indicates that aloe vera may also be effective in cancer prevention. Besides serving as a home remedy for several conditions, the plant is broad and distinctive looking, and highly decorative in the home.